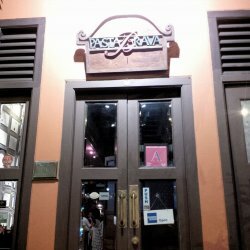 *Charmaine and I chanced upon Pasta Brava, located along the row of conservation shophouses at Tanjong Pagar area. The dimly romantic interior decor was both tasteful and intimate, yet there was no pretentiousness to it at all. There are Straits Chinese decorations and souveinirs around the restaurant, as well as paintings done by the owner's brother. 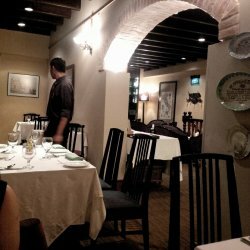 The restaurant has two stories, and we were sitting on level 2, where we enjoyed the cozier end of the restaurant. The service crew was rather attentive towards the end of the meal. 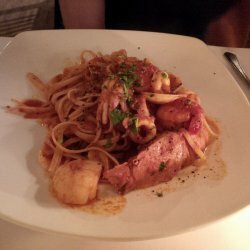 For mains, *Charmaine had the Linguine Regina del Mare (SGD$23.00) - linguine pasta with scallops, clams, prawns, squid, crayfish in garlic and tomato sauce. The linguine were springy and the gravy was a delicious mixture of sweet-sour flavour. I chose something under the "Pasta Fatta in Casa" (homemade pasta) section, the Agnolotti Farciti al Salmone (SGD$23.50) - round shaped pasta filled with fresh and smoked mashed salmon, served with tomato and cream sauce. 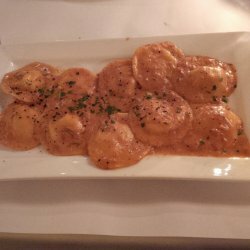 The pasta had a great chewy texture, and the mashed salmon was smooth, creamy, almost velvety on the tongue. It was utterly tasty.